Are you tired of messing around with a long Hose? Do you find it difficult to roll and unroll? If so, Hose reels are the perfect solution for you. These allow you to manage the long hoses without much of a problem efficiently. There are so many different variants available that can be difficult to choose the right one. Moreover, the design varies from one hose reel to another. Many people look at the length of the hose which it can accommodate and then choose the reel. You need to look at a few other factors as well to make it easy to use the real. That is why it is essential to know the factors which you should consider while buying such hose reels. Today, we will now share with you these factors but also the top 10 hose reels which you can purchase. The Reel which we are speaking about now retracts the hose completely. It means that the water hose comes out quickly as well. The swivel bracket along with the toolkit ensures that you can mount the reel on the wall. It has a locking mechanism to only use the hose reel up to the length which you want. With the stainless steel spring, you can pull out the reel as per your requirement. The retraction mechanism is automatic means that it will retract the hose reel smoothly. It can support up to 100 feet hose. The hose which comes along with it has a nozzle with nine different patterns. Thus, when you’re looking for the entire package, this is a good option. 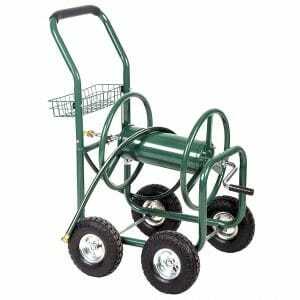 The BestMassage Garden Water Hose Reel which we are highlighting now comes in the form of a cart. The hose which comes along with it is of 300 feet. The assembling will take you 50 minutes which ensures that you can get it done quickly. The heavy-duty steel construction means that you can use it for months together without any wear and tear. It is powder coated which makes it weather resistant. In spite of the steel construction, the weight of the cart is on the lower side. It allows you to pull it quite easily. You can use it on sidewalks, gardens, lawns, etc. There is also a basket on offer in case you want to carry something. The handle allows you to release the hose as well as retract it as per your requirement. The 10-inch wheels make it heavy duty. If you’re looking for a hose reel which is effortless to move around, you can consider this option. The crank hose reel which we are speaking about now can accommodate 200 feet hose quite easily. The swivel design along with the handle at 90 allows you to use it efficiently. The lubricated bearings mean that the maintenance is on the lower side. There is also a locking pin to pull out the hose which you need. The one-piece steel body makes it superior to the other hose reels. It also makes the installment and attachment easy. The small form factor makes it suitable for you to move it around. The reason why it is on our list is due to its heavy duty construction and capability to handle the hose of 200 feet. The HOSELINK Automatic reel which we are speaking about now is elegant in design. It can hold a hose of 82 feet, and comes along with a reinforced hose. It also consists of threaded brass ends which mean that you can attach the nozzle quite easily. With the help of swivel bracket and the hardware set, you can mount it on the wall without any delay. 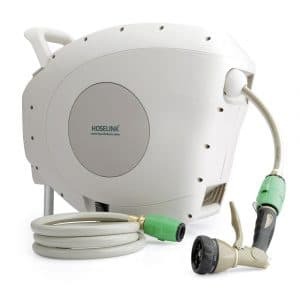 It also includes a seven function spray gun which makes it easy to use close. When not in use, the entire hose retracts into the reel which is a definite advantage. The spring-loaded retraction mechanism is highly durable. It comes along with integrated handles which allow you to carry it around. If you’re worried about the locking mechanism, it has a self-locking mechanism which is easy to use. Thus, if you’re looking for an elegant Reel, it does not get any better than this. 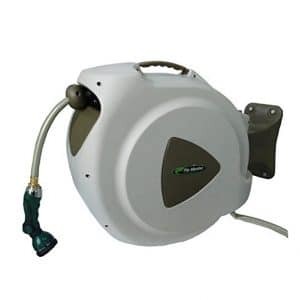 The swivel hose reel provides the hose of up to 100 feet. This heavy-duty bracket mounting mechanism allows you to mount it on the wall. You can easily reel your hose from any angle due to the circular design. 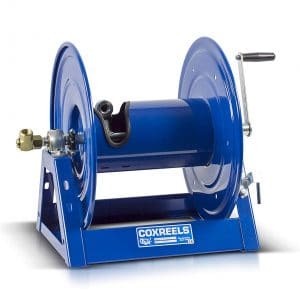 The steel reel has heavy duty construction. It consists of brass couplings and has stainless steel fixtures. The use of these materials makes it very strong. The heavy-duty bracing means that it will be stable on the wall for a long time. 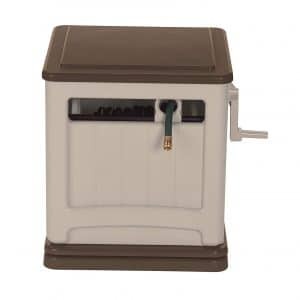 The anti-rust finish makes it suitable for outdoor use. 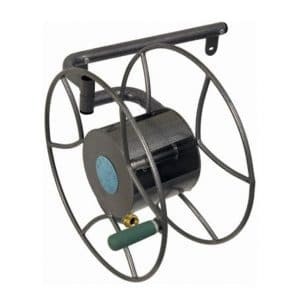 If you require a hose reel for outdoor use, you can buy this one. The next variant on our list is again the one which retracts the hose inside. 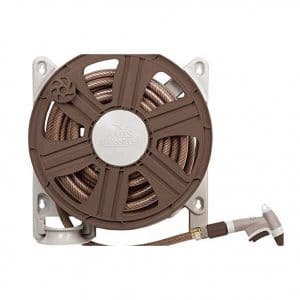 The advantage of the retractable design is that when not in use, the entire reel is inside. It comes along with 65 feet hose. The automatic-guide prevents any overlapping in the retraction process. It means that once you finish your work, it will retract in an orderly fashion. It also consists of a mounting bracket which allows you to mount it on the wall. All the hardware which you need comes along with it. The reinforced hose has brass ends. The advantage of the reinforced construction is that it can last for a long time. The eight pattern nozzle is more than enough for most of the watering applications. Thus, if you’re looking for a complete set along with the hose reel, you should go with this option. 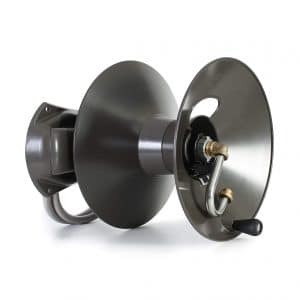 The next hose reel on our list has a side-mountable design which ensures that you can mount it on any wall. It can hold up to 100 feet of 5/8 inches hose. It means that you will have no problem at all in storing the long courses. The 100 feet hose is included along with it which allows you to start using it right away. It comes in the assembled form which makes it easy to mount the water hose. The neutral color along with the proper spinning grip makes it convenient to pull out the water hose when you want to use it. There is a guide incorporated into the design which makes the winding up easy. When you’re in the search for classic hose reels, you can check this out. The feature which will attract you about this hose reel is the vintage design. If you’re looking for something rustic and unique, this is the option which you should go with. The bronze finish makes it look antique. The cast aluminum construction makes it highly durable. It can hold 125 feet of hose. The cast aluminum construction means that you can use it outdoors as well. The powder coating on the outer side makes it weather resistant. Pulling out the hose is easy. It comes in the assembled form which reduces your effort. The brass fittings enhance its durability. When you’re looking for the vintage hose reels, this one is a good option. If you’re looking for hose reels which can hold a significant length of hose, you can consider this option. When using the 5/8 inches hose, it can hold 150 feet. When you’re using the inch hose, it can hold 100 feet. There is a six-foot-long rubber inlet which helps you keep the water hose in place. It consists of brass fittings. You can mount it on the wall in the position as per your convenience. The die-cast aluminum construction adds to the durability. Owing to the aluminum construction, it is also lightweight in design. It is weather resistant which makes it perfect for outdoor use. The installation on the wall is easy which reduces your time and effort. 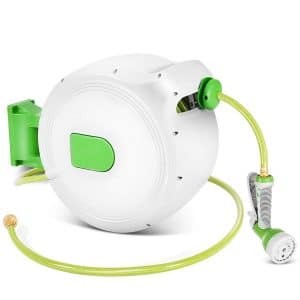 Thus, if you’re looking for hose reels which durable and easy to use, you can check this one. The Sun cast hose reel which is on top of our list has a unique feature. It hides the hose completely inside itself. It means that from the outer side, you can never know that it is one of those hose reels. There is a crank handle which allows you to retract the hose smoothly. The resin structure makes it lightweight but highly durable. There is a proper guide to make winding and unwinding smooth and easy. It provides a watertight connection between the reel and the hose. The 360 swiveling base means that you can secure it on the ground or the wall. It can handle UV rays which allow you to keep it outdoors. It is highly portable. Since it comes in the assembled form, you don’t need to worry about putting in the effort for the same. You will not need any tools to start utilizing it. It is compatible with the standard 5/8 inch. 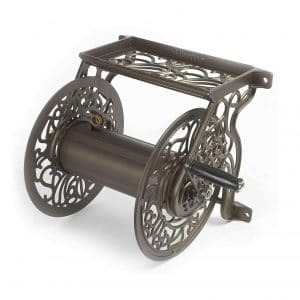 Thus, when you’re looking for a discreet and elegant side reel, you can consider this option. Design: You have to look at the reel design. Some of them are entirely retractable. You have to pull the hose out. Some others roll it in a proper format. You have to decide on the design which is more suitable for you. The capacity of the reel: Each hose reel can accommodate the hose up to a specific length. For example, if you have a hose tube of 25 feet, you should choose a hose reel which can fit at least that much of size. You have to look at the capacity and then take a call. Construction: The construction of the reel will determine its durability. If it is not heavy-duty in nature, you cannot use the hose reel outdoors. Most times, you will use the hose outdoors. It can be during extreme weather as well. That is why; it is better to choose a reel which is heavy duty in construction. It should be water repellent to a certain extent. Portability: Only when you can quickly move it around, it will be easy to carry the hose wherever you want. You have to look at the portability of the reel before taking a call. So, when you’re looking for hose reels, you can go through our list above to pick the right one. The ten options which we have listed above can make the task of managing your hose very simple. It is time to stop manually dealing with your water hose and use these reels to your advantage.